Caja Laboral Vitoria cruised to its seventh consecutive Turkish Airlines Euroleague victory by trouncing Fenerbahce Ulker Istanbul 75-97 Friday at Fenerbahce Ulker Sports Arena. Andres Nocioni led five Vitoria scorers in double figures with 19 points as Coach Zan Tabak’s men outshot and outrebounded the hosts to win in style. 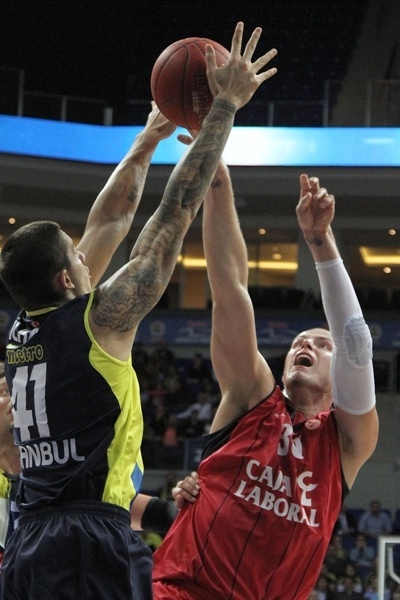 Caja Laboral improved to 4-0 in Group F, while dropping Fenerbahce to 0-4. The game was close until midway through the second quarter, but the visitors finished the half on a 2-15 charge led by Nemanja Bjelica and Fernando San Emeterio to take a 32-48 halftime lead. The hosts cut the gap to 8 in the third quarter, but Vitoria pushed back and 10 unanswered points bridging the end of the third quarter and the start of the fourth made it 51-73 to secure the outcome early. Nemanja Bjelica finished with 16 points for Vitoria, San Emeterio and Maciej Lampe added 13 points apiece and Milko Bjelica finished with 10. 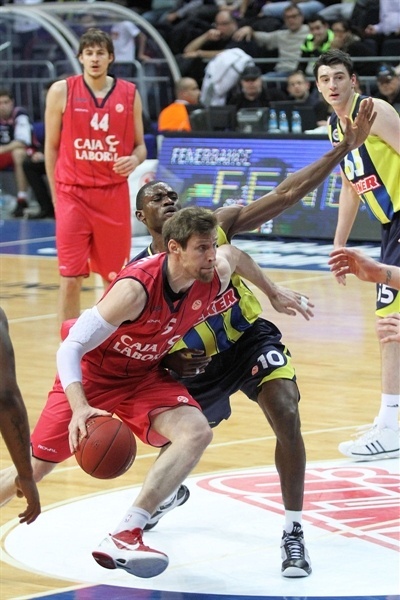 Emir Preldzic and Bojan Bogdanovic led Fenerbahce with 16 points each, Bo McCalebb netted 15 and Oguz Savas 11. Caja Laboral took it to the hosts early. 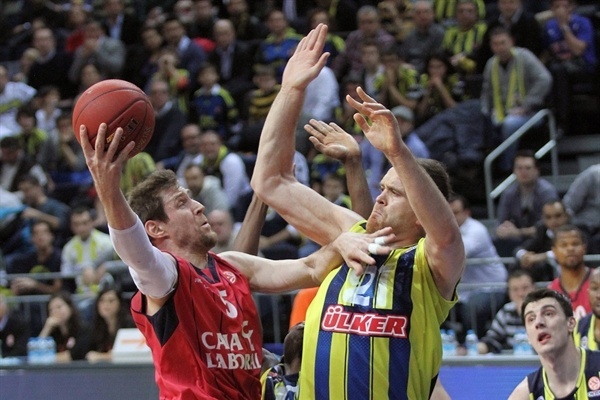 Lampe scored on the visitors first possession before Mike Batiste matched for Fener. Nocioni beat Romain Sato to the rim and Thomas Heurtel set up Milko Bjelica to make it 2-6. 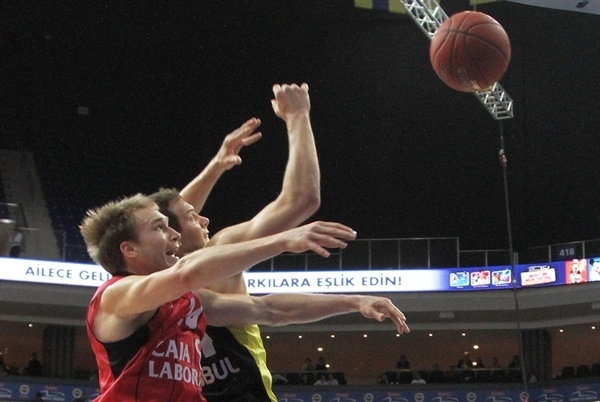 Bogdanovic and McCalebb heated up to tie the game and put Fenerbahce ahead, 10-8. McCalebb’s basket-plus foul in transition completed a 9-0 run before Omar Cook drained a triple from the corner. Nocioni scored from downtown before a steal by Cook led to a Lampe basket and a 15-16 Vitoria advantage. The lead switched hands on baskets by Preldzic and Milko Bjelica. 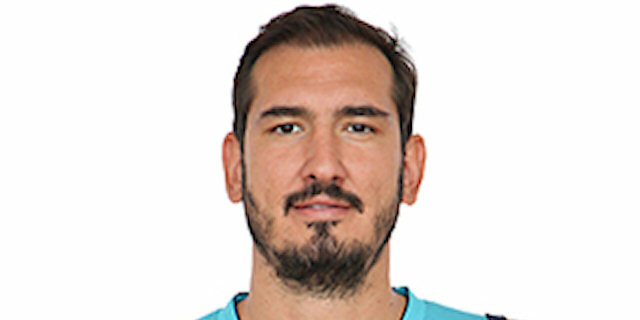 A clever pass by Fabien Causeur set Milko Bjelica up for a slam, but Ilkan Karaman followed up a Bogdanovic miss with a dunk on the last play of the quarter to make it 19-20 after 10 minutes. Nocioni took Preldzic down with a hard, unsportsmanlike foul, which allowed the hosts to regain the lead. Preldzic made the free throws and Savas went through Tibor Pleiss to complete a 5-point possession. A Fernando San Emeterio three-pointer narrowed the gap to 1 again. And Nemanja Bjelica fired in a deep triple to make it 26-28. Nemanja Bjelica’s third three of the game added to the Vitoria lead. Pleiss added a short jumper to make it 28-33 before McCalebb completed a brilliant drive for the hosts. Nemanja Bjelica and Causeur knocked down back-to-back threes to silence Fenerbahce Ulker Sports Arena and increase the advantage to 9. After Sato free throws, San Emeterio fed Lampe for a two-handed slam and the swingman then knocked down a triple to make it 32-44. San Emeterio added another layup and Nemanja Bjelica hit a pair of free throws to bring a 2-15 charge into the locker room; 32-48 for Vitoria ta halftime. After the hosts went 0 for 7 from downtown in the first half, Preldzic opened the second with a three-pointer. Savas made it a 5-0 start to the half before Nocioni got the visitors going from the line. 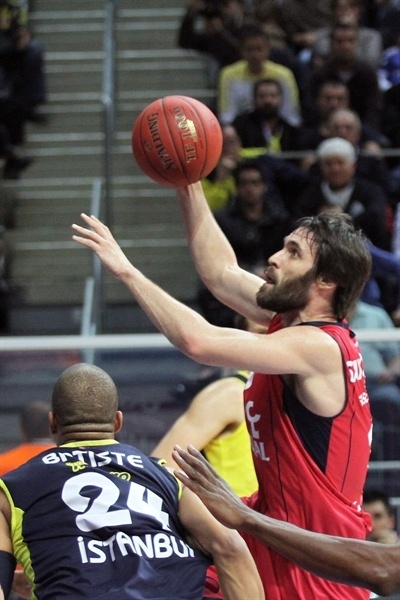 Fenerbahce failed to take advantage of a technical foul on Vitoria coach Tabak as Preldzic missed twice from the line. However a three by Preldzic and a tough basket by Bogdanovic closed the difference to 42-50. Nocioni continued to star for the visitors; he added 2 more from the line and a basket in transition to restore a 12-point lead. Lampe’s tip-in caused the hosts to call timeout. Coach Pianigiani’s pep talk worked as Savas and Preldzic scored on the next two Fener possessions. But the surge was short lived. Nocioni free throws soon had Vitoria ahead 46-60. Bogdanovic generated 4 points from the line for Fenerbahce, but Vitoris always had an answer. A steal and layup by Cook extended the lead to 16, Nocioni added a jumper and Pleiss’s tip in put Vitoria ahead 51-71 through three quarters. 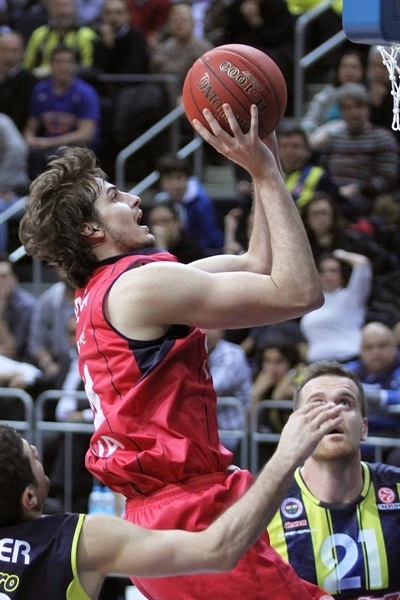 Milko Bjelica capped a 0-10 Vitoria run on the first play of the fourth quarter. McCalebb chiseled away at the deficit with 4 free throws – 2 of which came after he drew Pleiss’s fifth foul. Even after a Bogdanovic layup, the home team trailed 59-78. 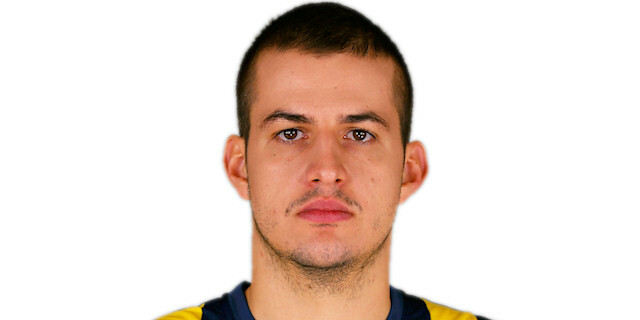 Fenerbahce found its form on offense and got as close as 67-83 on Uros Tripkovic’s first basket for his new team. Alas a San Emeterio tip-in made it a 20-point game again as the visitors relaxed down the stretch with another big road win in their pocket. "Obviously I have to say sorry to the Fenerbahce fans. We cannot accept this kind of performance. We were playing against a good Euroleague team. We missed some open shots and when they scored two or three times and we went down by 6, 7, 8 points, we completely stopped playing. This is unbelievable. Like our last quarter against Maccabi Tel Aviv. This is the first time in my life I have seen something like this. It’s not like the players are bad guys; it’s the confidence. The first 15 minutes we played the right way, we just missed some open shots. And after that, the last minutes of the second quarter killed our games. This is incredible and for sure not acceptable. " "Tonight we had a very important win against Fenerbahce Ulker on the road. This is one of the toughest road games for any team. The main reason we won the game was our defense. I can’t say that we did the tactical things very well, but our defence brought the game to us. Generally we did the small things better than Fenerbahce Ulker. Another important thing is that we won the game against one of the top scoring teams of the Top 16 with our good defense." "Unfortunately we lost another game at home and our fourth game in the Top 16. Tonight, once again we couldn’t show resistance in the critical moments of the game. When they started to show strength at the end of the second quarter, we gave up and let them go instead of fighting. There’s not much to say about the rest of the game." "It was a very important game for us to keep our rythm in the Top 16. We started the game well but they balanced it soon. Our tough defense at the end of the second quarter was the main reason for our win. We are happy to win our fourth game in a row and hope to keep going on like this."